A friend suggested recently ,’ You should join sareepact – You and sarees seem to be inseparable!’Thank s to her I am finally here, browsing through the vibrant pages and pictures of amazing and beautiful weaves- just like their wearers. I think I was 3 when I got my first saree. My grandma loved gifting these cotton sarees to all little girls. Coarse cotton material with striped designs, very Bangali looking. “Dooray sharee”as my mom told me. I loved draping it in front of the mirror just as my mother would. She was a school teacher. Every day at 9 in themorning she would drape her stiffluly starched ironed cotton sarees in front of the mirror. Patiently pleating the long pleats the anchol and finally pinning them over her left shoulder. The fun part was that Baba would always be seen adding the finishing touches by helping her line up all the long pleats so they wouldn’t pouf up. Without any complain before he left for office. That was a touch that I was too young to understand. At 5 feet 3 inches this slim mom of mine looked simply perfect. I wS obsessed watching her and trying to practice with my kids saree after she left. My ayah didi would help me dress up before we sat to feed and dress up my 4 little dolls. And they had sarees too! 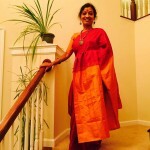 After four decades I am still obsessed with sarees – mostly cotton handlooms and silks. 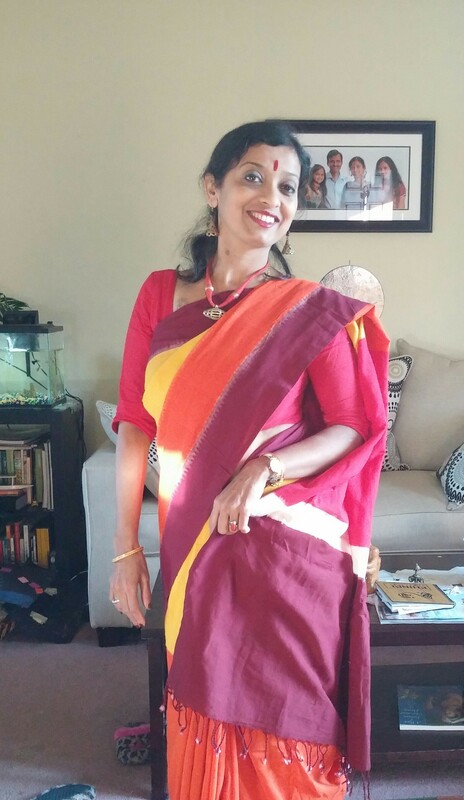 Did I mention sarees helped me boost my confidence and actually has defined who I am today? Well that can be said on another day.